PT Bank Mandiri Taspen - Bank Mantap is a rapid growing commercial bank in Indonesia based in Denpasar Bali. Bank Mandiri Taspen has a business competencies on business development of Micro and Small Enterprises segment (SME/UMKM), Retail and Pension. Bank Mandiri Taspen was previously known as Bank Mandiri Taspen Pos. Bank Mandiri Taspen is a synergy of 2 state-owned financial companies; PT Bank Mandiri (Persero) Tbk and PT TASPEN (Persero). As of December 2017, Bank Mandiri Taspen is 59.44% owned by PT Bank Mandiri (Persero) Tbk, 40% by state-owned pension insurance firm PT TASPEN (Persero), and 0.56% by IB Made Putra Jandhana. At present, Bank Mandiri Taspen offer services through 191 office networks spread in all over Indonesia and directly employs nearly 2,154 staff. According to information found PT Bank Mandiri Taspen Pos Annual Report 2017 as cited by JobsCDC.com, Bank Mandiri Taspen's performance achievement throughout 2017 showed satisfactory results. Bank Mandiri Taspen registered a 215.86% growth in total net profit of Rp 160.04 billion in 2017 as compared with Rp 50.67 billion in 2016. Total asset in 2017 amounted to Rp 13,687.70 billion or increased from Rp 7,391.27 billion in 2016. JobsCDC.com now available on android device. Download now on Google Play here. Please be aware of recruitment fraud. The entire stage of this selection process is free of charge. 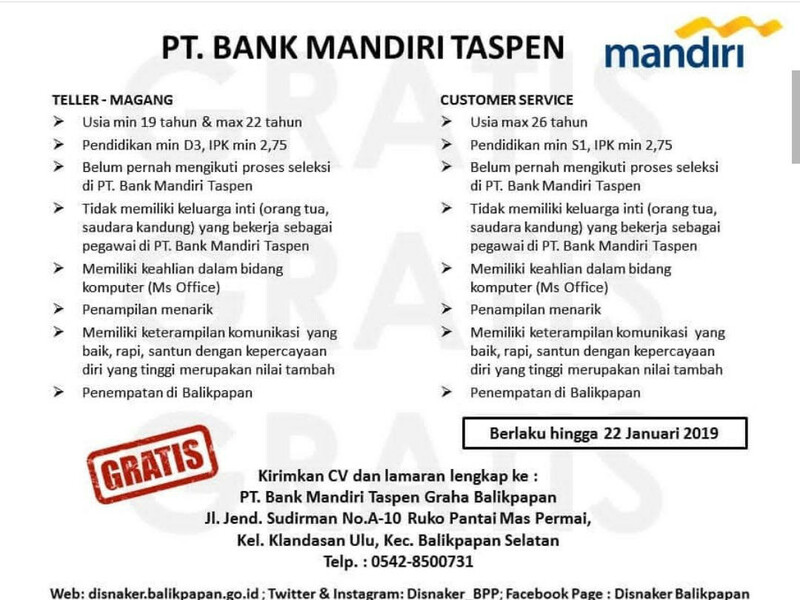 PT Bank Mandiri Taspen - D3, S1 Teller, Customer Service Mandiri Group January 2019 will never ask for fees or upfront payments for any purposes during the recruitment process such as transportation and accommodation.